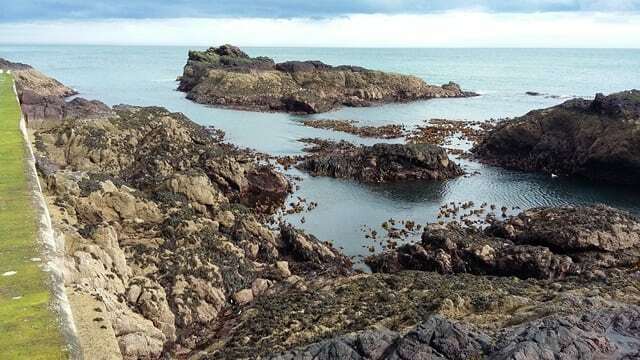 The Scottish Coastal Observatory (SCObs) monitors the temperature, salinity, nutrients and plankton community at a number of sites around the Scottish coast. 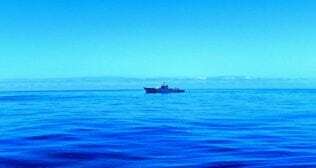 The efforts of Marine Scotland scientists are supported by a network of local citizen-scientists who deploy small temperature sensors and collect water samples for analysis. Many of the SCObs sites have been collecting data since 1997, and a first report featuring observations up to 2013 was recently published. Monthly means of the data presented in the report are available for download. More recently, SCObs has also established a site at St Abbs, on the Scottish east coast, almost 50 miles south of Edinburgh. In collaboration with staff at the St Abbs Marine Station, temperature sensors have been deployed since July 2013. From April 2017, the monitoring is expanding to include the collection of water samples for salinity, nutrient and phytoplankton analysis. 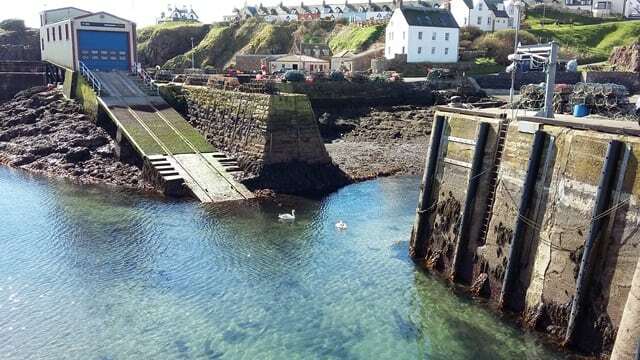 Dave Lee and Bee Berx from the Oceanography Group travelled down to St Abbs on 31 March, to deliver the kit needed for the St Abbs Marine Station staff to collect and store samples. After a short training session, they were also treated to possibly the tastiest Cullen Skink around, before heading home. So, how do our citizen-scientist volunteers help SCObs? Volunteers who collect samples are sent empty vials, bottles and phytoplankton sampling equipment, which they use to collect water samples on a weekly basis. Nutrient samples are frozen, while the preserved phytoplankton samples and salinity bottles are stored at room temperature. Samples are returned to the Marine Laboratory in Aberdeen on a regular basis, and the samples are analysed. Meantime, the volunteers receive replacement sampling kit from Marine Scotland. The volunteers also deploy and recover the temperature sensors: these are attached to piers or buoys, where they are permanently submerged. Every three months, the volunteers also post these back. The data is downloaded from the instrument, and a new sensor is posted out to the volunteers. The St Abbs Marine Station is a registered charity and has a research collaboration agreement with Edinburgh Napier and Heriot-Watt universities. All three partners are members of the Marine Alliance for Science and Technology Scotland (MASTS). They particularly focus on issues related to marine conservation and sustainability, as well as education and providing excellent research facilities. Hi. I am coming from Wales on 22 June to visit st abbs. My father Mr Robert Thomson lived there with his brothers and sister. His father whom I think was Mr James or Jimmy Thomson was a lighthouse keeper at St. Abbs I’m Trying to find out a a bit about my father’s life or history there ive have never visited St Abbs before my father was born in 1910 and was the youngest of 7 children. If you have any details you could give me I would be very grateful thank you. Hello Susan. If you contact the Northern Lighthouse Board (https://www.nlb.org.uk/ContactUs/ContactUs/Main/) they should be able to help you further.